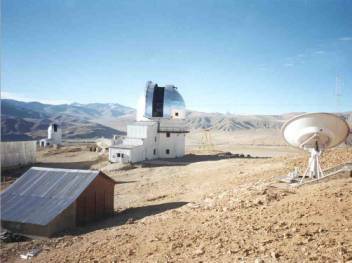 The 2-m Himalayan Chandra Telescope (HCT) at the Indian Astronomical Observatory (IAO), Mt. Saraswati, Digpa-ratsa Ri, Hanle at an altitude of 4500 m (15000 ft) above msl is operated by the Indian Institute of Astrophysics (IIA), Bangalore. It is remotely operated using a dedicated satellite communication link from the Centre for Research & Education in Science & Technology (CREST), Indian Institute of Astrophysics, Hosakote, about 35 km northeast of Bangalore. The Himalayan Faint Object Spectrograph Camera (HFOSC) and the TIFR NIR Spectrometer and Image (TIRSPEC) are available for regular observations. The Telescope is available to the astronomical community. The Observatory accepts Target of Opportunity proposals, and Guest astronomers may need to accommodate such programmes in a part of their allotted time. Some time is reserved for preventive maintenance of the telescope and instruments (scheduled around full moon), and for Observatory programmes. The HCT Time Allocation Committee (HTAC) has been constituted by the Director, IIA, with H.P. SIngh (Delhi University, Chair), Brijesh Kumar (ARIES), Shashikiran Ganesh (PRL), A. Goswami (IIA), D.K. Sahu (IIA, Convenor) and S. Muneer (IIA) as members. HTAC invites observing proposals from astronomers. Proposals are called for three times a year. The three cycle periods and their corresponding deadlines are given below. Guest observers can operate the telescope and instrument from CREST using the satellite communication link. There could be occasional problems at night which can be attended by experts only during the following day. Proposals and queries may be sent to htac@iiap.res.in. HCT accepts proposals under "Director's Discretionary Time". Allotment for DDT time will be done by Director, IIA in consultation with Prof-in-Charge, IAO, with information to Chair, HTAC. The proposals to be considered under DDT should be sent to the Director with a copy to Prof-in-Charge and HTAC. Accepted ToO proposals do not qualify as DDT proposals. Objects that fall within accepted proposals (regular, time critical and/or ToO) are not eligible to be considered under DDT. In the absence of any compensation time towards DDT request, the night(s) reserved as DDT will be with the observatory and may be partially used for observatory proposals/ the accepted ToO proposals and any such request. Request for use of this time may be made to the Director with a copy to the Prof-in-Charge, IAO. The data policy for compensation time is similar to that for regular proposals. However, the lock-in period of all the data obtained through DDT or use of DDT night (except compensation time) is 90 days from the date of observation.